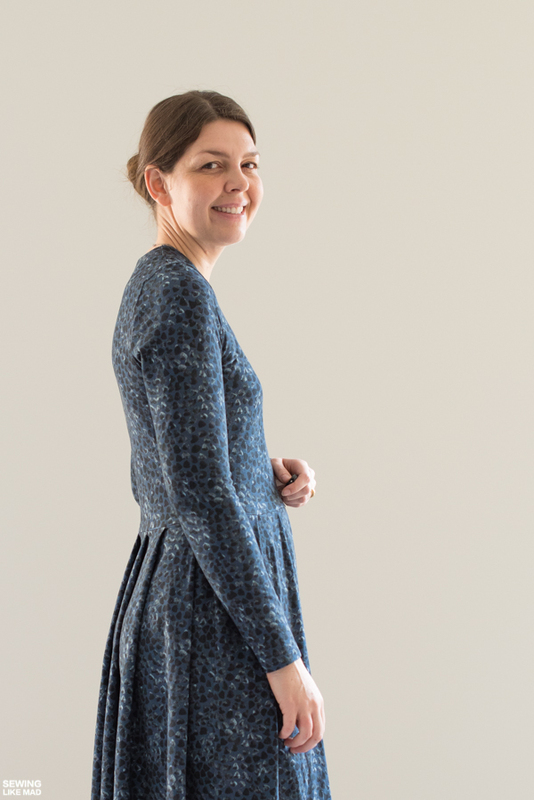 Sewing Like Mad: Tuuli V-neck Jersey Dress by Named. Tuuli V-neck Jersey Dress by Named. I can't tell you how good it feels to finally have sewn this dress. 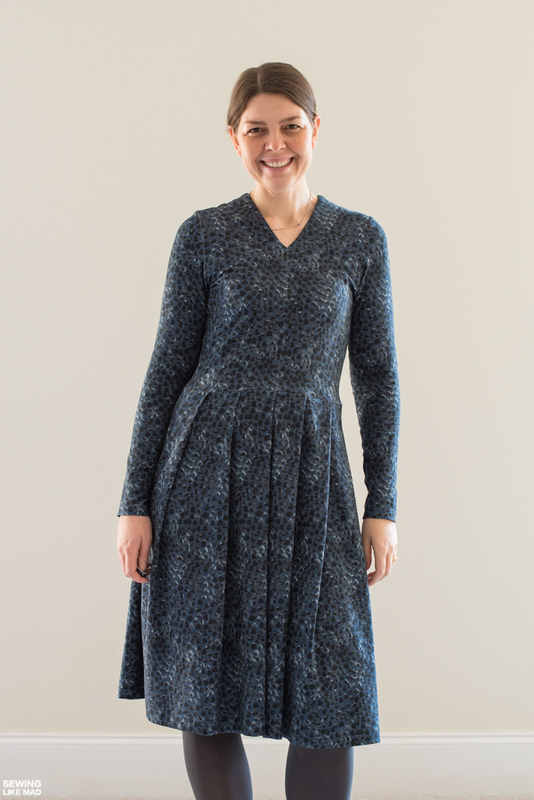 The Tuuli V-neck Jersey Dress by Named. Why you might ask? Well, I've had it printed and taped together forever. Like 6 months or so. And it's been lying on my floor looking at me with a clear question in mind....WHEN are you going to sew ME? I was just kind of scared. 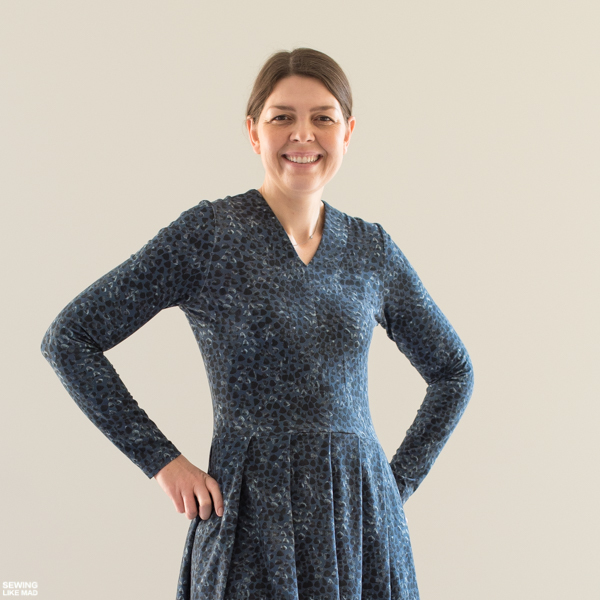 It's a two-in-one pattern and you get a dress with a tight fitting bodice and a pleated skirt plus a bodysuit. 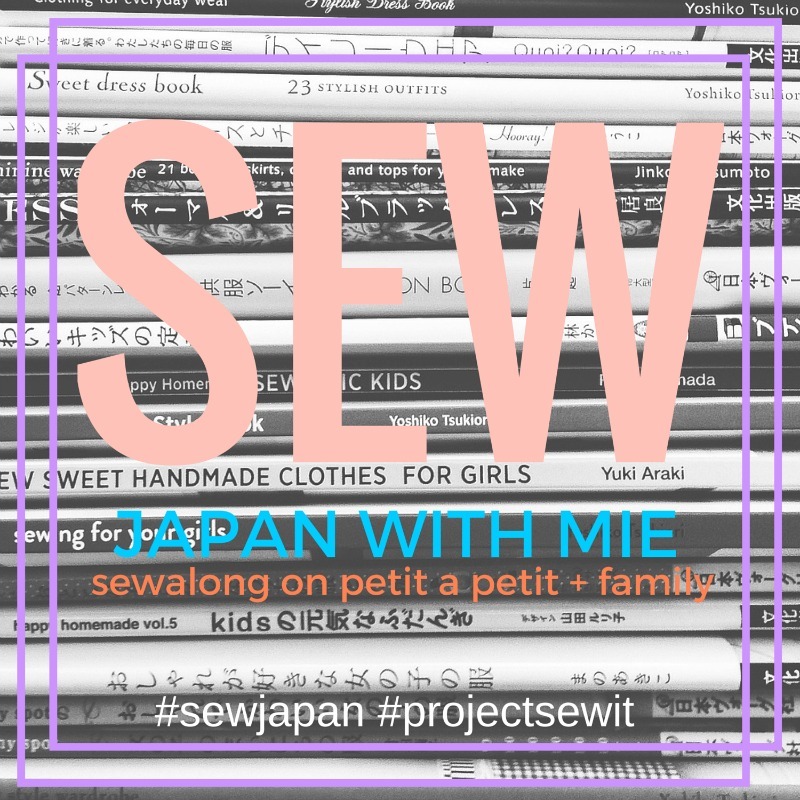 The whole thought of figuring out which size to make with a pattern that has negative ease (because it's knit and tight fitting) and knowing that whatever knit chosen would also affect the finished fit/size was just too many variables and I just kept not making it and not making it. Until one day where I finally took at decision on both size and fabric and sewed it up in a jiffy and wouldn't you know it....it fits pretty good. Can you give me a P, an H, an E and a W! So I made the EUR 40 / US 8 / UK 12. My waist measurement is between size 38 and 40 but I knew I didn't wanted it it super tight, so I made the 40. I added 2.5 cm to the length of the bodice and 5 cm to the sleeve length. I made my skirt 70 cm long and I actually don't know how that differs from the original pattern. The reason for that, is the way I printed it. I noticed that the skirt is made from two rectangles. I obviously needed the top part because I needed the pleat notches but I felt printing the whole rectangle would be a waste of paper, so I just printed the top row and measured on the fabric for the rest. 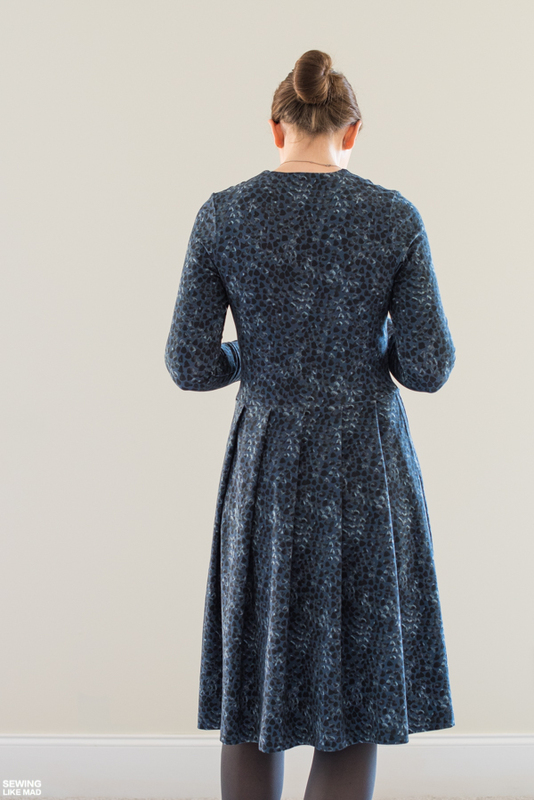 The pattern is made with 1 cm / 3/8" seam allowance but except for shoulder seams (which have to fit the sleeve), neckline and waist I just overlocked it together with a 4-thread overlock seam but without cutting off the extra SA. That means this is more of a size 40.5. 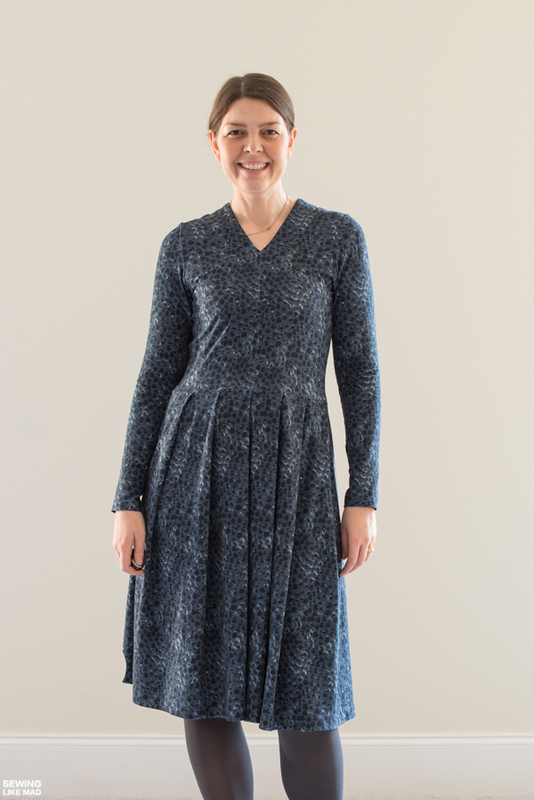 And I used this gorgeous SORA jersey knit from Nosh Organics in blue black and grey tones. The fabric is super wide (190-195 cm, gulp) and I had no problems fitting it in on the 2 meters that I had, even though the pattern calls for 2.75-3 yards (of less wide fabric). It's perfect for this dress as it's stretchy but not in a way where it's really had to work with plus it's 100% opaque. I raised the V in the neckline (see how HERE) but now that I see the finished result I don't think I needed to. But I'm definitely not picking it all apart to lower it again. This will do but I'll probably change it back to original V if/when I make another one. Now that I know how crazy fast this pattern is to make, I don't see why I shouldn't make more. I also totally want to make the bodysuit, oh boy the 80s are so coming back. I did raise my waist seam on the back bodice at CB a bit (as in made the height of CB shorter) but as you can see in this photo above, it needed more. The whole waist seam basically needs to be tipped forward. It's too high in the front and too low in the back. 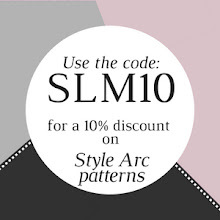 I don't necessarily think that's a problem with the pattern, it can just as well be an individual fitting for my body. I do know it's a thing I usually end up doing when I draft or fit dresses with a waist seam like this. I this case I just needed more than expected. It's an easy fix and not something that makes this one not wearable. I love how the wide pleats leaves the skirt fitted at the top and then flares out at the bottom hem. There is just something SO elegant over pleats. 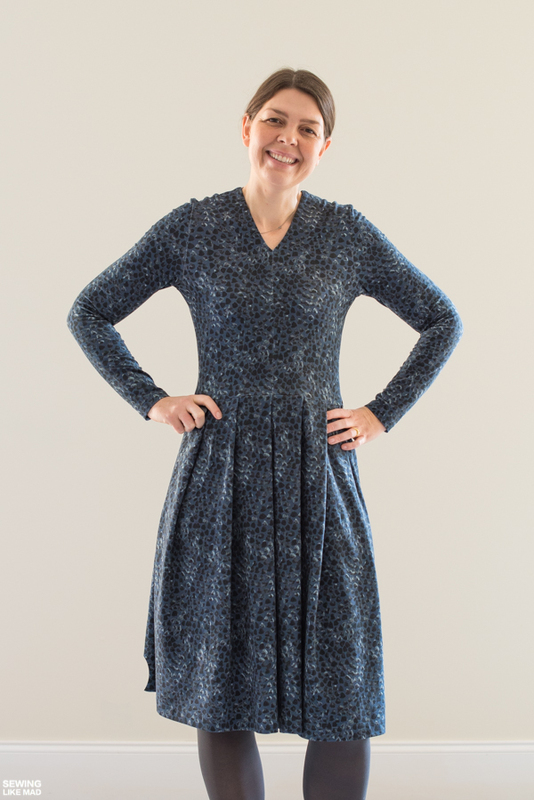 Get your Tuuli V-neck Jersey Dress pattern HERE. And get your SORA jersey HERE. I love love this dress! It's so classy and beautiful, yet still comfy and totally suitable for every day. Gorgeous! What a beautiful, beautiful dress!! 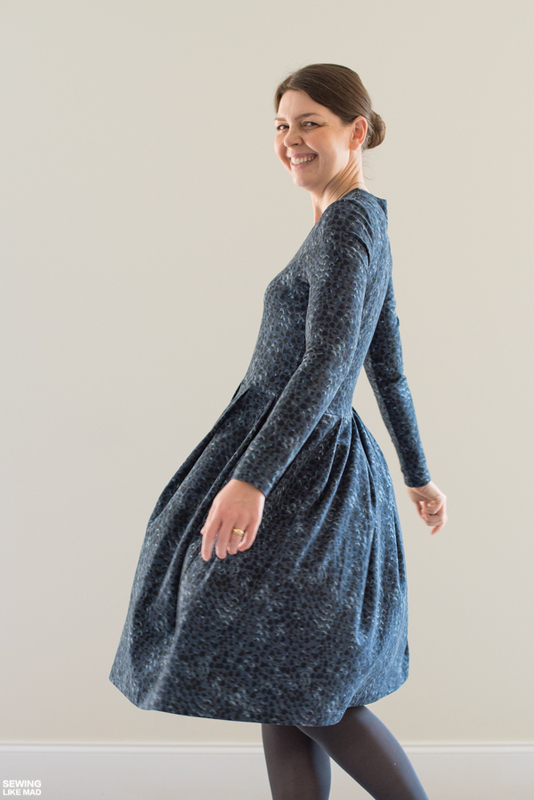 That gorgeous fabric goes so well with this pattern, and it looks like a dream <3 I adore the pleats, too! This dress in this fabric... wow!!! So beautiful! This dress is sooooo great!!! I really want one!! 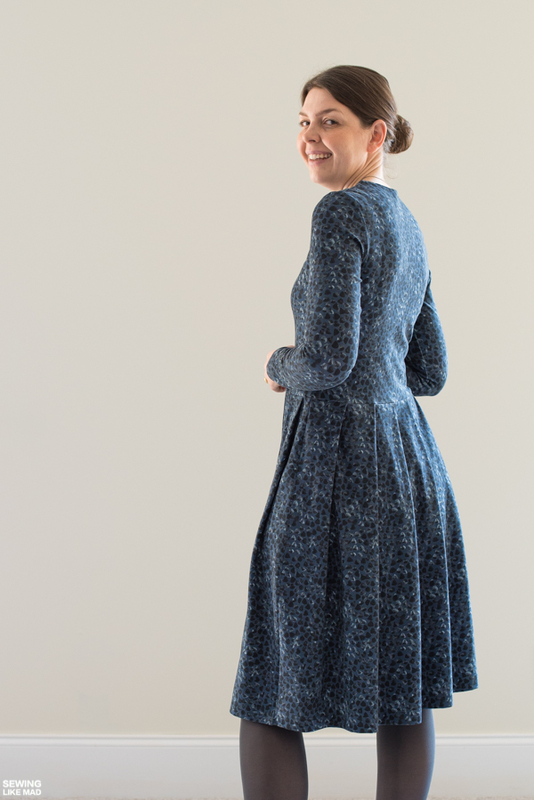 You look amazing and it's so good to know this sews up so fast! I have this pattern too and I'd love to make the body suit! Beautiful! Beautiful dress, beautiful fabric, it looks great on you! Great fit and tips! So pretty on you! Wowww so so gorgeous! I haven't seen this dress before but your beautiful dress is making me want to get the pattern right now! A great read and your dress turned out beautifully!